Zakutor comes in a nice box, which actually fits in my light tent, unlike the Kyoryujin's behemoth of a box. Zakutor is Kyoryu Green’s trusty mecha, which comes with Jyudenchi (Beast Battery) # 4. When it is inserted into Zakutor, the tail splits into three parts. Zakutor looks pretty much like his green, yellow and silver counterpart in the show. The “tor” in Zakutor comes from the word Velociraptor, which it is, though it may not look the part. The predominantly flat features and chunky proportion of this toy fall short of the sleek hunters that most, if not all of us, associate with Velociraptors. Many of the physical features of a raptor have been altered for the design of this toy. The three claws on each of its hands and feet have been condensed down to a single blade, which do make it look quite deadly, but a lot less like a raptor's claws. The face is a good representation of a Velociraptor face. However, the neck on this toy is unlike the long necks of Velociraptors. The underside is pretty flat, with the two predominent features being the button for releasing the battery and the black hand conveniently places in the dino's crotch area. As for articulation, I was surprised that legs and elbows actually have joints. Dricera and Stegotchi limbs were just stubby legs, molded in a single piece; so it was nice to be able to mess with the arms and legs of Zakutor a bit. In order to get Zakutor ready to join the Kyoryujin, the legs need to be flipped back, while the arms tuck into a slot on the back of the legs. Zakutor takes the place of Dricera on the Kyoryujin. Of course, it can be fitted on the other side; but in keeping with the show, Zakutor play the part left arm. 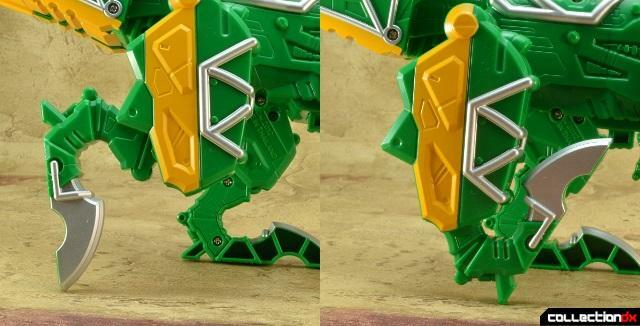 It becomes an arm with deadly looking blades for the Kyoryujin, which I must admit looks pretty sweet. The battery for this toy, like the others, makes sounds when inserted into Gabutyra. 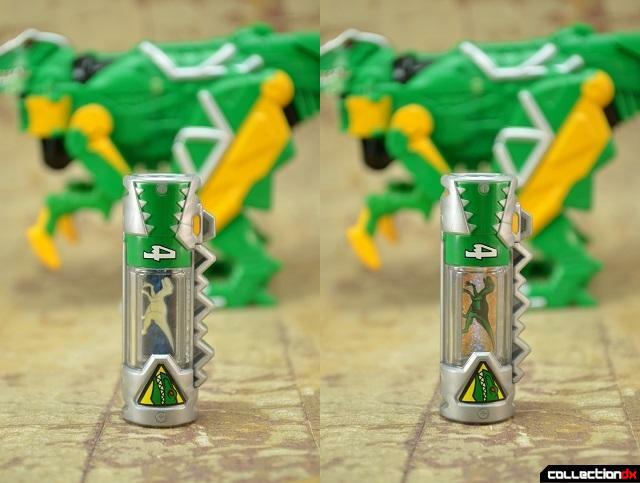 When readying the Kyoryujin to combine, the battery will elicit a “Gaburincho! Zakutor!” When in Kyoryujin form, the battery will play the slashing sound effects for Zakutor’s special attack. Overall, this is a so-so release. Zakutor succeeds at being an awesome claw, and at being true to the source material. Unfortunateley, Zakutor fails at being a Velociraptor, which is pretty important for toy based on a such an iconic dinosaur. Fixed. Thanks for the heads up! I must have had a moment of dislexya. Zakutor is part of the Kyoryujin Western, but I think you are referring to the other arm of the Western combination. Parasagan is the right arm and does indeed turn into a gun type weapon. Yeah; it's more I thought the idea was that Western was John Wooing it up with two different guns to shoot the hell out of things (very Django flavour of the moment etc), rather than the one gun and a... claw. Nice review. That's one heck of a jaw! The components are just getting worse and worse as the show progresses and the toys roll out. I cant imagine how the final clusterf@©k form would look like. IMHO, this is THE WORST super sentai. Ever.